He's facing a strong challenge from Democrat Danny O'Connor, even in a heavily Republican district. WESTERVILLE, Ohio — President Donald Trump’s preferred congressional candidate – and his chief legislative achievement – are about to be tested in battleground Ohio in the season’s final high-stakes special election. The midsummer affair comes as Trump’s shadow looms over primary contests in four other states on Tuesday, none bigger than Kansas, where the Republican president roiled the governor’s race Monday by opposing the sitting GOP governor on the eve of the election. The races, like dozens before them, pit the strength of the Republican president’s fiery coalition against the Democratic Party’s anti-Trump resistance. The results will help determine the political landscape – and Trump’s standing within his own party – just three months before the GOP defends its House and Senate majorities across the nation. But there was little evidence of enthusiasm on the eve of the election as Balderson tried to connect with voters over the phone during a brief stop at a campaign phone bank. He appeared equally uncomfortable answering questions from reporters about whether Trump’s appearance might blunt the impact of the recent endorsement from a prominent Trump adversary, Republican Gov. John Kasich. “It’s going to be tough, but we feel very positive, we feel very good with the amount of volunteers that we’ve had here, the enthusiasm, the amount of hours that we’ve put in,” Balderson said. It’s unclear, however, whether Trump’s support helps or hurts his preferred candidate. Described by campaign operatives as a “Whole Foods” district, the largely suburban region features a far more affluent and educated voter base than the typical Trump stronghold. Kasich, a leading voice in the GOP’s shrinking anti-Trump wing, previously represented the district in Congress. The race has centered on Trump’s tax cuts at times as much as the candidates themselves. O’Connor and his Democratic allies have railed against the tax plan, casting it as a giveaway for the rich that exacerbates federal deficits and threatens Medicare and Social Security. Balderson and his Republican allies have backed away from the tax plan in recent weeks, training their fire instead on top House Democrat Nancy Pelosi. O’Connor has dominated Balderson on the local airwaves. His campaign spent $2.25 million on advertising compared to Balderson’s $507,000, according to campaign tallies of ad spending. The Republican campaign arm and its allied super PAC was forced to pick up the slack, spending more than $4 million between them. 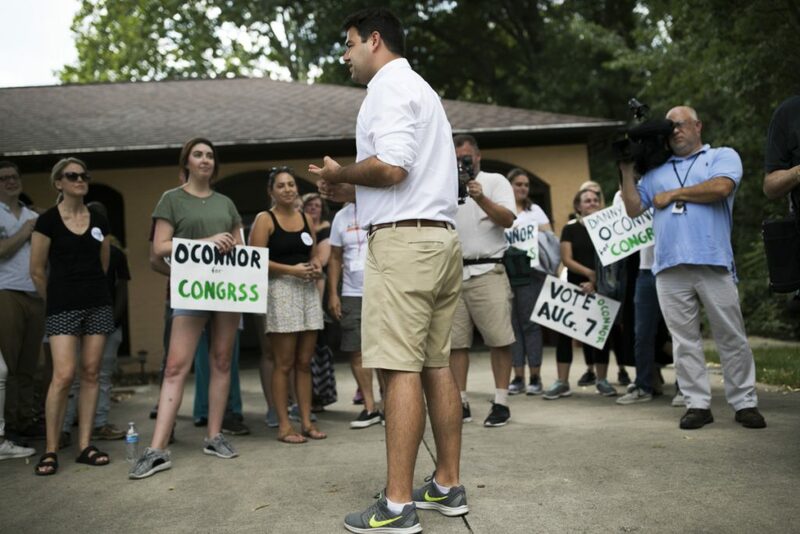 During a lively event in a Democrat-heavy Columbus neighborhood Monday, O’Connor urged volunteer canvassers to think about what’s at stake for working people, including access to affordable health care. Should the polarizing Kobach win, some Republican operatives fear he could lose the governor’s seat to Democrats this fall. The race could become further disrupted if Kansas City-area businessman Greg Orman makes it onto the November ballot. He submitted petitions Monday with more than 10,000 signatures for what could become the most serious independent run for Kansas governor in decades. Trump didn’t seem worried about Kobach’s prospects. Voters in suburban Detroit will also weigh in on the direction of the Democratic Party. Three mainstream Democrats are viewed as leaders to vie for retiring Republican Rep. Dave Trott’s seat in November. The field includes Fayrouz Saad, who would be the first Muslim woman in Congress. Senate contests in Missouri and Michigan will come into focus as two vulnerable Senate Democrats, Missouri’s Claire McCaskill and Minnesota’s Debbie Stabenow, are expected to easily claim their party’s nominations. Missouri Attorney General Josh Hawley is expected to take on McCaskill, while in Michigan, military veteran and business executive John James is vying for the chance to knock off Stabenow. He’d join Sen. Tim Scott as the only black Republican senators if he did.